1. Peel the potatoes and reserve the skins. Preheat the oven to 200°C, gas mark 6. Place the skins onto a baking sheet and roast until they are golden brown and crispy. 2. Make a bouquet garni by taking a piece of muslin and wrapping up the thyme, cloves, bay leaf, black peppercorns and roasted potato skins. Tie the muslin up into a bag to enclose the filling and set aside. 3. Place the bacon onto a baking tray. Bake for 10-12 minutes until crispy. Drain off the fat, allow to cool, then chop into small pieces. 4. Thinly slice the onions, leeks and potatoes. Place them into a large pan with the butter and sweat over a medium heat for 10 minutes until softened. Add the chicken stock and the bouquet garni, and cover. Simmer for 30 minutes until the potatoes are tender. Add the cream, and simmer for a further 10 minutes. 5. Remove the bouquet garni. Transfer the soup to a blender and blend on the highest setting for 2 minutes, or until silky smooth. Adjust the seasoning with salt. 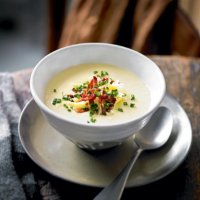 Pour into bowls and garnish with the bacon pieces, coarsely grated Cheddar and the chives.